to ordinary folks, hammock and bathtub has no absolute relation but UK-based design studio managed to combine these two seemingly unrelated objects into a beautiful and uniquely different bathtub, dubbed the Vessel. 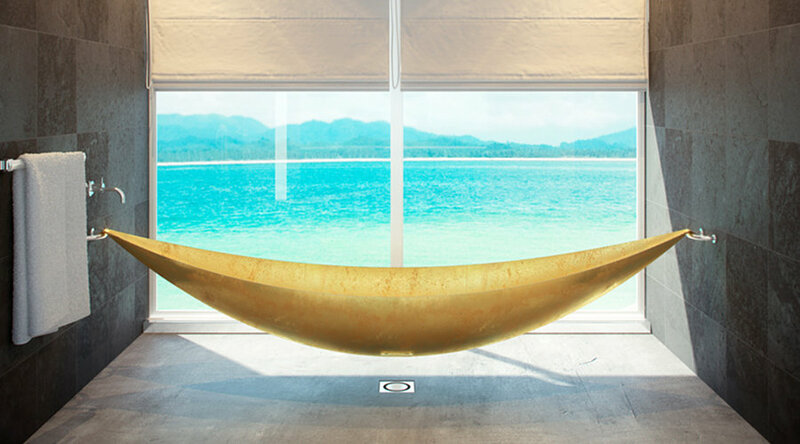 drawing its inspiration from a suspended hammock and taking advantage of the strength that yields from high tech material such as carbon fiber, the team has created an unique bathtub that will literally elevate your bathing experience. finally, stainless steel hardware and gold leaf are added to further improved its overall aesthetic. the end result is a one of the kind bathtub that will probably make you want to spend your time bathing. though we noted that you probably will need to have a custom size bathroom of a reason large size to accommodate such as a beautiful object. no word on how much it would cost or its availability but our gut feel is, this ain’t going to be anywhere near affordable. N°1 by Corcel – do bathtub really needs to be in carbon fiber? Previous PostPhotorito Lens Wrap wraps like a real burritoNext PostBoogie Board Rip – finally, you can save your work!